Did you know Ryan (my son, not the Republican nominee for Vice President) has a lot in common with Mitt Romney (yes, that Mitt Romney)? I’m going to do my best to avoid this being a political post, because as much as I love a good political argument, that is not really the type of conversation I want here. But I’m in need of a laugh, and the story is too good not to share, so consider yourself warned. Ryan (my son) doesn’t have much of a political platform, other than a demand for an immediate end to the NHL lockout that yesterday resulted in the first two weeks of the regular season being cancelled. Oh, and if anyone came after Elmo with a budget knife during his first seven or eight years of life, our entire family would have stormed the castle, so to speak. The point is, Ryan (for the rest of the post you can assume I am referring to my son unless I specify otherwise) doesn’t really follow current events. Every once in a while he’ll surprise us, such as when he misidentified the world’s most notorious terrorist, or the governor of New Jersey, or ventured a guess as to the voting leanings of the Boston Bruins goalie. Most of the time, “current events” to Ryan are last night’s NHL standings. Ryan tends to categorize people into broad groups, which he uses to eliminate any possibility of interest in large swaths of the population. For example, girls for the most part are uninteresting to him. Boys who don’t like sports don’t make the cut. This actually represents progress as it used to be boys who don’t like hockey. We have been working with Ryan on this concept for some time. We want him to understand that just because someone doesn’t share your point of view on everything, they can still be your friend. It has been a losing battle. As if we had any doubt, he made things clear in a recent conversation with Veronica. 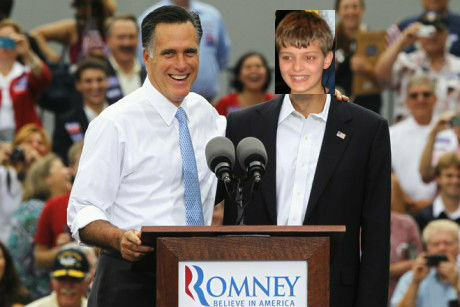 “Hey mom, me and Mitt Romney are just alike,” he declared quite out of the blue. Intrigued, Veronica pressed for details. OK, so maybe we had a bit of conversation in my house following the whole 47% thing. And, for approximately the 3,864th time, Ryan proved that just because he appears not to listen or participate in the conversation DOESN’T MEAN HE’S NOT TAKING IT ALL IN. Note: if you have strong feelings about the political sentiment expressed here there’s a place far better then the comments to express them. Please vote!